Noor Al Malki isn’t likely to win any medals at the 2012 London Olympics, but her appearance is going to be one of the most memorable events of the summer. This summer, there are going to be three female Qatari athletes representing their nation and competing against the best in the world. It will be the first time that the country has sent women to the summer games since 1984. The tiny country is aiming to become a world class sporting nation and is also hoping to stage the 2020 Olympic Games in Doha and knows that its traditional practice, along with Saudi Arabia and Brunei, in only sending men to the games was damaging those chances. Noor, her name means “light” in Arabic, can’t wait to get to England to take part in the 100 and 200 meters – the glamour events. As a sprinter, perhaps the most popular event in the entire games, Noor will probably hog most of the headlines, but there are two other women competing. 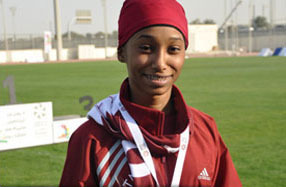 Air rifle shooter Bahia Al-Hamad was, like Noor, offered a wildcard invitation to go to London by the International Olympic Committee. The same happened to swimmer Mohammed Wafa Arakji, who will be aiming to make waves in the pool. Noora Al Mannai is the CEO of Doha’s 2020 bid and is delighted that the nation will have female representation in London. “We want to show that this is a special time in our region, a time to inspire change among young people and to help empower girls and women through sport,” he said. Much has been made of Saudi Arabia. There was hope that the nation would send women to London, but that was extinguished in April There’s still a chance that Saudi Arabia could send women, but they wouldn’t be part of the official team. As far as Qatar is concerned, the country’s first Olympic medalist, Mohammed Suleiman, who won bronze in the 1500 meters in Barcelona in 1992, is excited about the new developments. Seoul exceeded its own expectations at this year’s Olympics. Expect that to continue in 2016. 2012 London Olympics ShowdownIndia Steps Up For 2012 OlympicsCan Indian Hockey Shine Again?Tokyo Makes Final ThreeMalaysian Badminton Ace Out?